Having recently created the 1000th bookmark on my Delicious site, it’s as good a time as any to pause and reflect on social bookmarking. I think Delicious itself is one of the most smartly realised websites out there. Its pared-down 2008 redesign – with its two-colour, modular interface – perfectly suits my design sensibilities. Not only is this one of my most important social media resources, but is one that has significantly changed the way I think about collecting Web-based content. I can confidently and routinely save and forget about the resources I tag, yet easily find them again when required (evidence that tools can and do shape practice). Any ‘intra-personal’ tagging inconsistencies are quickly resolved by occasional housekeeping. Just how social is social bookmarking? I’m fully aware of the social and collaborative affordances of social bookmarking sites like Delicious, yet I consider my own resource as predominantly a personal rather than social bookmarking site. Clearly there are specific strategies and methods that can be adopted to utilise participatory features such as networks and subscriptions, yet I’ve never been motivated to apply them regularly. Is this use of Delicious typical, or am I oblivious to widespread social and collaborative practices across bookmarking sites? I also wonder how distinctive folksonomies represented by the collective tagging of a platform like Delicious actually are. When I’ve occasionally used Delicious as a social search engine, results have been interesting, yet I’ve not been inspired to adopt this activity regularly. If the majority of users are saving Web resources based on Google searches and social networking interactions, does social bookmarking merely replicate existing and more dominant systems? I’d be interested in any thoughts on this. It’s several months now since I started using Twitter. It’s usefulness as a research tool became increasingly apparent as my following and followers matured. For me, the tipping point was the introduction of the automatic twitter feature in Delicious. Now, nearly all my new bookmarks are automatically twittered. Whilst my Delicious is long established as an effective personal management resource, I have never really engaged with the ‘social-ness’ of social bookmarking. Attempts at using Delicious networking facilities – and with it the potential to extend bookmark annotation to a collaborative activity – have been largely unsuccessful. Twitter’s 140 word limit restricts any annotation (or indeed, critical discourse in general) to that of the soundbite – which is why blogging remains important – yet its value in broadcasting key links in a timely and socially constructive environment is a powerful process which Delicious never really capitalised on. * I am aware that this phrase has been adopted as a name for several mashup tools (without the !) but you just can’t think up anything these days without someone getting there first. It’s several months now since I started using twitter. It’s usefulness as a research tool became increasingly apparent as my following and followers matured. For me, the tipping point was the introduction of the integrated tweet feature in delicious. Now, nearly all my new bookmarks are automatically twittered. Whilst my delicious is long established as an effective personal management resource, I have never really engaged with the ‘social-ness’ of social bookmarking. My attempts at using delicious networking facilities – and with it the potential to extend bookmark annotation to a participatory activity – have been largely unsuccessful. Twitter’s 140 word limit restricts any annotation (or indeed, critical discourse in general) to that of the soundbite – which is why blogging remains important – yet its value in broadcasting web links in a timely and socially constructive environment is a powerful process which delicious never really capitalised on. * I am aware that this phrase (without the !) has been adopted as a name for several mashup tools, but you just can’t think up anything these days without someone getting there first. This is just a small part of my Delicious site as interpreted by the CALIBRATE visualization programme developed by Joris Klerkx in the Department of Computer Science at Katholieke Universiteit Leuven. The tool identifies and presents tag and community (multiple-user) relational structures using cluster mapping, and integrates a list view and frequency filter. In a paper just published online in the Journal of Digital Information, Klerkx and Erik Duval describe the development of the programme and present results from ‘Think Aloud’ user testing and post-experimental questionnaires. You can download the software and view a demo video here. Klerkx, J. & E. Duval, E. (2009). 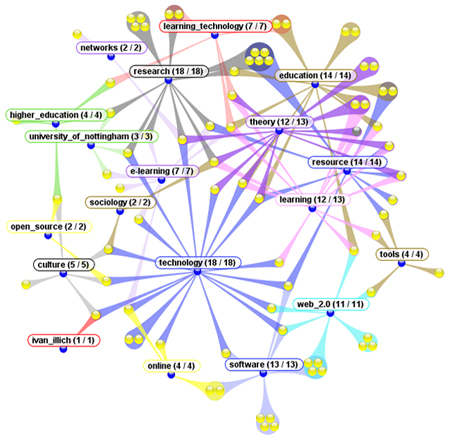 Visualising Social Bookmarks. Journal of Digital Information, 10(2).